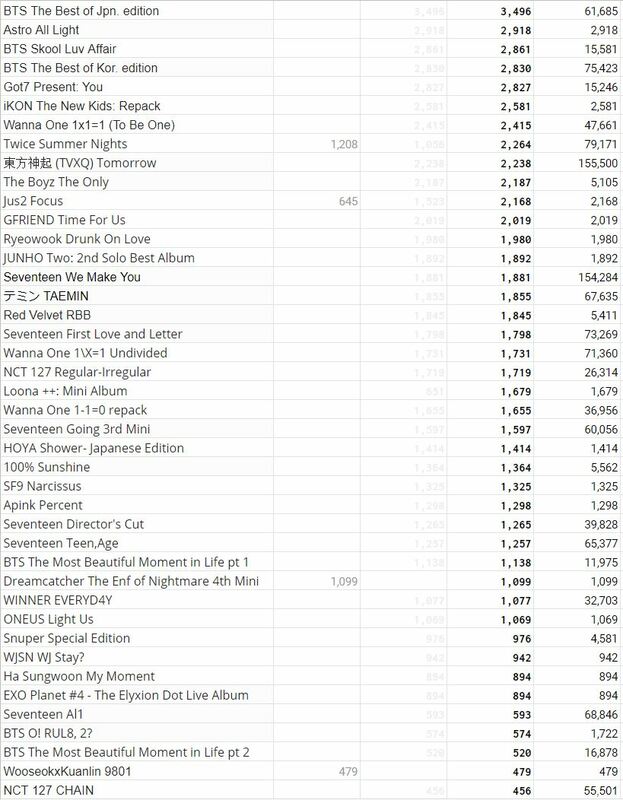 This thread is a compilation of Hallyu stars' physical sales in Japan (musical materials only) as they make their way over to the close-by country. 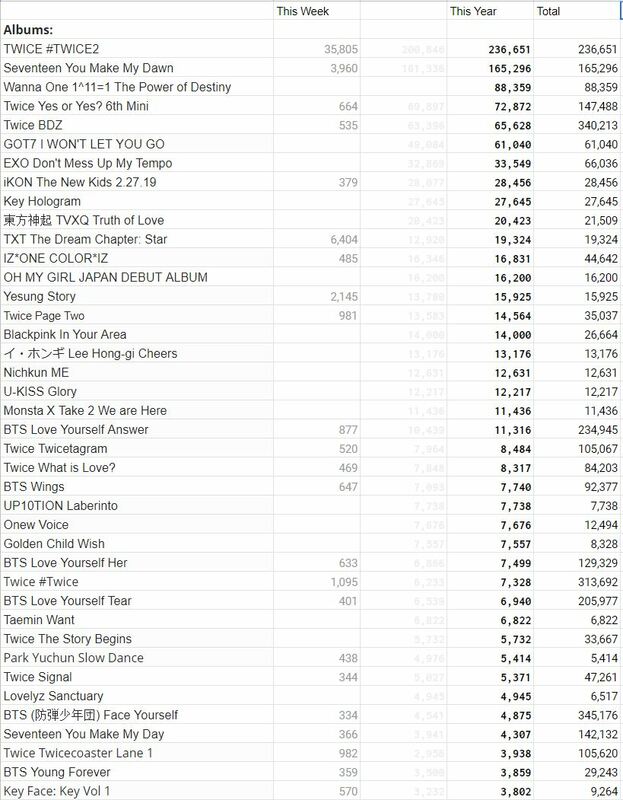 All numbers are taken and compiled from Oricon and it 's more of a database than anything, so please no fanwars. If you would like to contribute, feel free to. 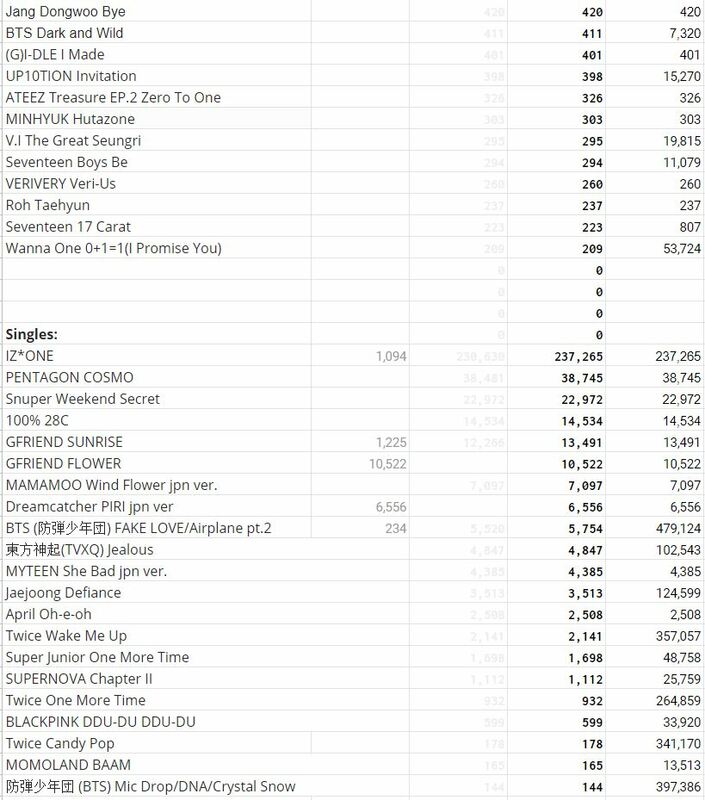 Note: Sales from the charting year of 2019 total sales will be in () for releases before 2019. Uta De Manabu Kankokugo -BoA "No.1": ??? Oricon puts out Japanese music charts, similar to the Billboard charts in the US. The name "Oricon" is derived from the English words "original confidence". Oricon maintains several ranking lists and publishes them on its website. While paying customers have access to the full lists, a slimmed down version is available for free (the Weekly Top 50 for singles and albums). The first thing you should know is that Ninki does NOT predict sales. The ratings, which are results of a poll conducted by Oricon, are merely numbers indicating the amount of interest shown in an upcoming release. The predictions is a general indication of how a release will perform on the Oricon chart in terms of position. Almost all Japanese singles or albums are released on Wednesdays, and there is a reason behind this. I'm going to use KARA's Mister as an example. The single was released on August 11 2010, but it actually hit the shelves on August 10. The Oricon data released on August 11 is actually a reflection of the sales of the single from Tuesday, August 10. Likewise, the Oricon data released on Thursday, August 12, reflects Wednesday's sale. The typical Oricon week for a new release looks like this: Tuesday, Wednesday, Thursday, Friday, Saturday, and Sunday, then the sales from these six days are compiled into the weekly chart. For old releases (read: after first week of release), the weekly chart consists of sales from all seven days of the week. In order to achieve the highest sale possible on the weekly chart, artists usually release their work on Wednesdays. When is the Oricon chart usually updated? The daily charts are usually updated around 7pm JST, and the weekly charts around 5pm on every Tuesday/Wednesday. At the end of the week, Oricon will put together the data from the daily rankings PLUS additional reported sales from retailers that only send in their data once a week. This is why there is usually a small boost in the weekly charts. Starting September 01, 2009, Oricon implemented a new rule which only accounts 30% of a single/album's sales when a non-Oricon establishment sells that single/album. In other words, if for instance copies of a single/album were being sold at a meet and greet, a handshaking event, or during merchandise sales at the front of concert venues (where you are able to buy your concert goods like uchiwas and t-shirts before the concert doors open and such), than Oricon will only take into account 30% of the sales that the event "sold" during that time. If at the event 5,000 copies of a single/album were sold, only 30% of the 5,000 copies would be added onto the Oricon sales figure. In other words, only 1,500 copies of the 5,000 copies sold at the event would count towards the Oricon charts. Oricon began this rule because there was no official way for them to know the amount of copies actually sold at the time of the event. This rule is to prevent fraudulent record sales that record companies may give in order to boost their artist's sales figure. Best OP ever, tbh :wub: Keep up the good work, fantomas! Good work! Glad this thread could be resurrected! Thx fantomas, welcome the thread back! Yay thanks fantomas. Good to see this thread again, my favorite. Glad to see this thread again. :ilikeit: Thank you fantomas. I'm happy the thread is still going. Thank you fantomas for resurrecting this thread! 10 21.30 Sonar Pocket - Kataomoi ~Linaria~ / Startline! 02 65.50 NAOTO INTIRAYMI - Nice catch the moment!